NEW YORK (CelebrityAccess MediaWire) — The winners of the 2006 Billboard Touring Awards at the Roosevelt Hotel in New York City on November 9 were based on actual box office figures reported to Billboard Boxscore from December 1, 2005–September 30, 2006. 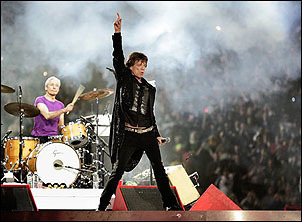 The Rolling Stones’ A Bigger Bang tour was recognized as the Top Tour based on gross dollars, and Top Draw based on ticket sales. The tour grossed nearly $230 million for the period that the awards cover and drew nearly 2 million fans to shows all over the world. Madonna was a finalist in four categories and won in two: Top Boxscore Award for her $22 million, eight-sellout stand at London’s Wembley Arena on her Confessions tour while her management team of Guy Oseary and Angela Becker picked up the Top Manager award. Nickelback won the Breakthrough Act award, given to a band still in its first decade of touring that breaks the Billboard top 25 tours for the first time. Kenny Chesney (with Dierks Bentley and others) received the Top Package nod for the second consecutive year. In addition, Billboard’s two new awards, Top Comedy Tour and Creative Content, went to Larry the Cable Guy and Cirque Du Soleil’s Delirium, respectively.